Holi, the festival of colors, is celebrated all over India. As stated in different religious literature, this festival signifies the victory of good over the bad things. When it is all about Holi, people call for celebration using colors or what is termed as gulal of different colors. 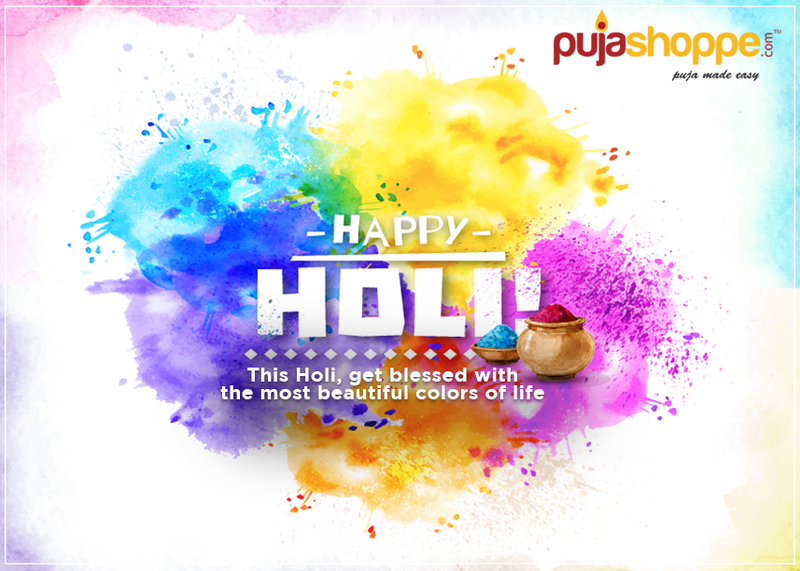 Many people also perform pujas using different puja items on the auspicious occasion of Holi. The term ‘holi’ is derived from the name of the sister of Hiranyakashyap. Her name was Holika. Her brother, Hiranyakashyap, was blessed by Lord Vishnu. The Lord blessed him with the power that no one can kill him, neither any human nor an animal and he will be worshipped by everyone. But surprisingly, his own son, Prahlad was seen worshipping Vishnu and not his own father. This made Hiranyakashyap angry. He attempted different ways to kill his son but kept on failing miserably. Once he tried to throw his son into a deep well but surprisingly, Prahlad remained unscathed. He also tried to give him poison that became nectar at the time of feeding the little one. He also ordered wild animals to kill him but none of them harmed him. Lastly, Hiranyakashyap left him in a room full of snakes but it didn’t work too and his son came out uninjured. At last, Hiranyakashyap called his sister, Holika, for help. Holika came and took the little one in her arms in a fire to burn him but she covered herself with a blanket to stay safe. Fortunately, the blanket flew over to Hiranyakashyap’s son thus, leaving Holika in the fire to burn. This is the reason why Holi is celebrated. This festival is actually the Dahan or the victory of good over bad. This is the reason why the night before Holi, people are seen burning fire. What is the Significance of this Festival? In the birthplace of Krishna, this festival is celebrated as Rangpanchami. People enthusiastically celebrate Holi in memory of the love of Radha and Krishna as well. Krishna has a dark complexion but fell in love with Radha, a fair-skinned pretty girl. And it is believed that Krishna used to play Holi with different colors of gulal with Radha to make her face colorful. Besides playing holi with family and friends, many people offer the gulal to Lord Krishna in the puja performed in the morning at home as well. In this puja, the devotees also decorate the puja thali with different items like diyas, holi colors or gulal, etc. They complete the puja with complete devotion and then play holi with lost of cheerfulness. Previous PostMool Shanti Puja – Its Vidhi, Significance, and SamagrisNext PostWhat are the Advantages of Using Brass Items?